This durable, flavor-enhanced bone is perfect for aggressive chewing dogs, satisfying chew cravings in a healthy, natural way. 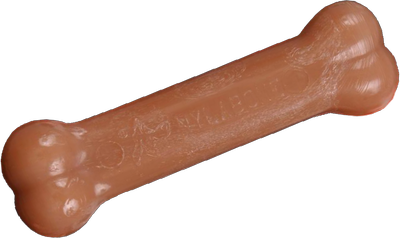 These bones discourage destructive chewing, fight boredom, clean teeth and provide hours of enjoyment for your dog. Wolf - 5 1/2" x 2", suitable for dogs 26-35 lbs. Giant - 8" x 2", suitable for dogs 36-50 lbs. NON-EDIBLE: Bristles raised during chewing help clean teeth and control plaque and tartar. Small shavings (no larger than a grain of rice) should pass through. Dogs should not bite off large pieces - replace when ends have worn down. Always supervise the use of chews and toys.